You can't always have your cake and eat it, too. But with frozen yogurt, you can. You can have a cool, creamy frozen dessert that doesn't bust the diet. As the "fro yo" craze matures into a billion-dollar industry, new franchises have to be increasingly creative to compete. 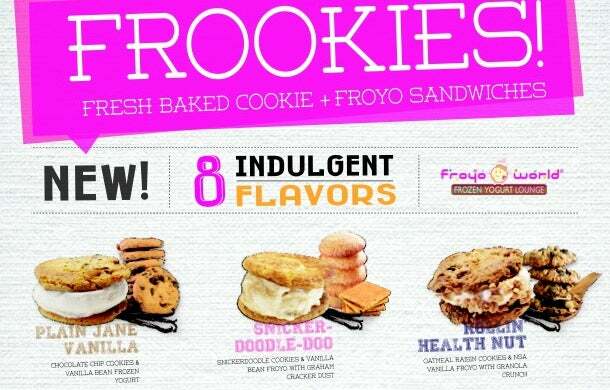 One of FroYoWorld's new product concepts is the "Frookie," frozen yogurt between two cookies. FroYoWorld: Dennis Bok, the co-founder and CEO of New Haven, Conn.-based FroYoWorld says kids drag their parents into the FroYoWorld stores because they like the smiling franchise mascot, ELFY, an acronym for "everybody loves frozen yogurt." Also, Bok rolls out proprietary flavors each month that customers seek out. Popular examples include blood orange, strawberry tart, and graham crackers and crème. The tart flavors tend to be more popular in urban areas and the more traditional flavors are more popular in suburban areas, says Bok. There are 30 FroYoWorld franchise locations open and another 30 finalizing leases and under construction. The highest-grossing FroYoWorld franchise made $1.35 million in annual revenue, Bok says. "We don't fear the competition. We are moving straight forward," Bok says. "We have a brand. We have a very big following." 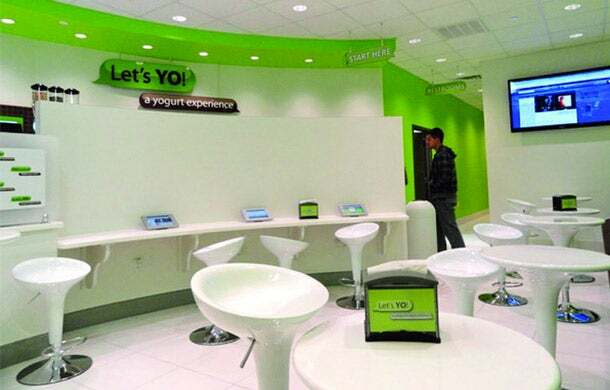 The interior of a Let's YO franchise location. Let's Yo: Eric Casaburi, the founder of Coltsneck, N.J.-based Let's Yo, says his frozen-yogurt franchise focuses on the in-store experience and high-tech marketing techniques. The frozen-yogurt shops have iPads on the tables for customers to use as they want and 60 inch jumbo flat screen TVs on the walls showing everything from sports games to the company's Facebook and Twitter accounts in real time. Let's Yo has 25 stores and another 15 in the pipeline. Let's Yo also has a paperless rewards programs which, if a customer opts to participate in, will track of every ounce of yogurt the customer consumes. Also, when the customer gets within a mile of a Let's Yo store, the customer gets a push notification on his or her phone with a discount. Casaburi knows the frozen-yogurt space is competitive. "In a few years, there will be a shakeout," says Casaburi. "It's Darwinian." Twins and co-CEOs, Jon (front) and Marvin Gurman. Yeh! Yogurt & Cafe: Marvin Gurman, president & CEO at Yeh! Yogurt & Cafe, says the self-serve component of Yeh! is critica. It is "big, big. I wouldn't even go into the regular businesses," Gurman says. "Go self-serve or go home." His franchise, in addition to offering frozen-yogurt, makes sweet crepes, serves waffles, coffee drinks including espresso and cappuccino and has a make-your-own cookie concept. Customers can pick regular, oatmeal or chocolate cookie dough and various mix-ins, like coconut or candies. The server mixes the dough and cooks the cookie in two minutes. He started Yeh! in 2008 in Montreal. The franchise is largely in Canada, but is beginning to reach into the U.S., with operations in New York, Massachusetts and California. "Maybe it's because of our roots growing up in Canada, you need some alternative products," says Gurman. By 2017, the entire U.S. frozen-yogurt industry, including both franchises and individual stores, is expected to bring in $931.5 million in revenue annually, according to a report from Los Angeles-based industry research firm, IBISWorld. TCBY is the dominant franchise in the industry in the U.S. with almost 18 percent of the market, as of Oct. 2012, the most recent industry-market research IBIS has available. Pinkberry is close on its heels with 17 percent of the U.S. market, and Red Mango has 15 percent of the U.S. industry, the report says. Even as consumers pinched their pennies during and after the Great Recession, the frozen-yogurt industry flourished. U.S. consumers have become increasingly health conscious and are willing to pay a premium for tasty options that are low-calorie, says the IBIS report. When tart frozen-yogurt came onto the cool, creamy scene, made especially popular by Pinkberry, the frozen-treat industry got a second wind. Also, serve-yourself chains popped into the mix, giving dieters another way to cut back calories by limiting their portion size, further increasing demand. In the five years leading up to 2012, the frozen-yogurt industry grew by an average of 3.7 percent per year to $760.1 million in annual sales, across the entire industry. In the next five years, as consumer discretionary spending picks up to pre-recessionary levels and the obsession with healthy-eating continues to accelerate, IBIS projects that the frozen-yogurt industry in the U.S. will grow at an even faster rate than it has in the previous five years. While there is expected to be growing demand for the frozen treat, IBIS says that pressure to sell it more cheaply will limit the pace of new-store growth. 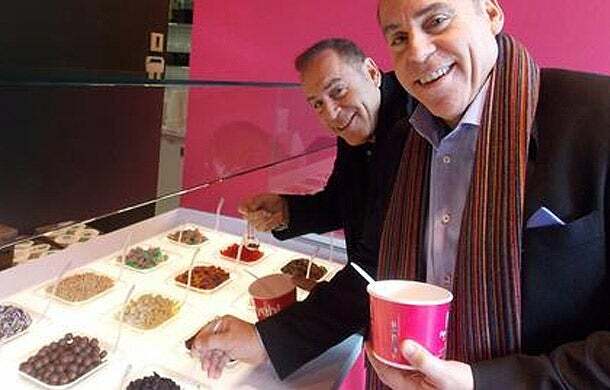 Menchie's says it wants to be the McDonalds of frozen yogurt. One of the bigger frozen-yogurt franchises expects that it will be the independent operations and smaller franchises that suffer. 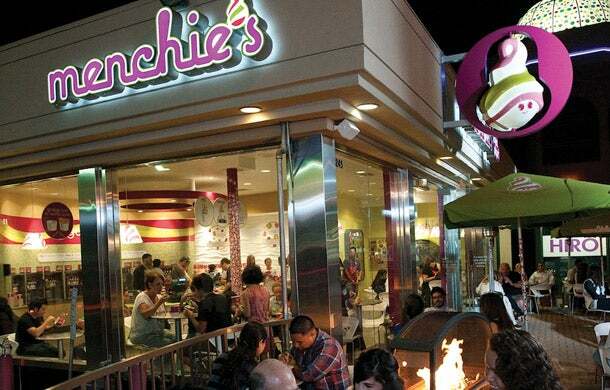 Menchie's, the fourth-largest frozen-yogurt franchise in the U.S., holds almost 13 percent of the U.S. industry, according to IBIS. There are 310 Menchie's stores open across the globe and another 300 being leased or constructed, says CEO Amit Kleinberger. The Los Angeles-based frozen-yogurt franchise brand is already global, stretching from China to Guam, and expects to be open in Malaysia, Singapore, Pakistan and Saudi Arabia by the end of the year. Menchie's focuses on making all of its guests have fun in the store and has developed a game for consumers to play on their mobile phones. Also, Menchie's aims to set itself apart by making clear that all of the milk that goes into Menchie's frozen yogurt comes from "healthy, California, happy cows," says Kleinberger. Kleinberger, who launched in 2007, says he welcomes the competition. And he also thinks that he will be the only frozen-yogurt operation still around in five years. "By the year 2015, you will see the emersion of what are the big three, four, five brands in the world," he says. "And I believe that we are going to be absolutely the McDonalds of the frozen yogurt industry by being the largest and the most advanced in our many offerings, quality, service etc." Most of the mom and pops and smaller franchises will be put out of business, he projects.